nd producing device, navigation lights and accident reporting. And in Colorado state boating laws require all paddle sports users under the age of thirteen must wear an approved PFD at all times. This guide will explain choosing the correct one, how to fit this the right way and the different styles. A life jacket or personal flotation device must keep your head above the water. When a PDF is fit too big, it will be able to ride high up around your face. If it has been fit too small, the PFD will not keep you afloat. Most importantly, adult sized flotation devices will not work for children. Check the manufactures label to ensure that the paddle board PFD is a proper fit for your size and weight. Make sure your PFD is correctly fastened. Ask a friend to grasp the tops of the arms and gently pull upward. Make sue there is not excess room above the openings and the PFD does not ride up over your chin and face. For best results try the paddle board PFD is shallow water under safe and supervised conditions. The Float-Shack will personally fit each member of your party with a USCG approved PFD. 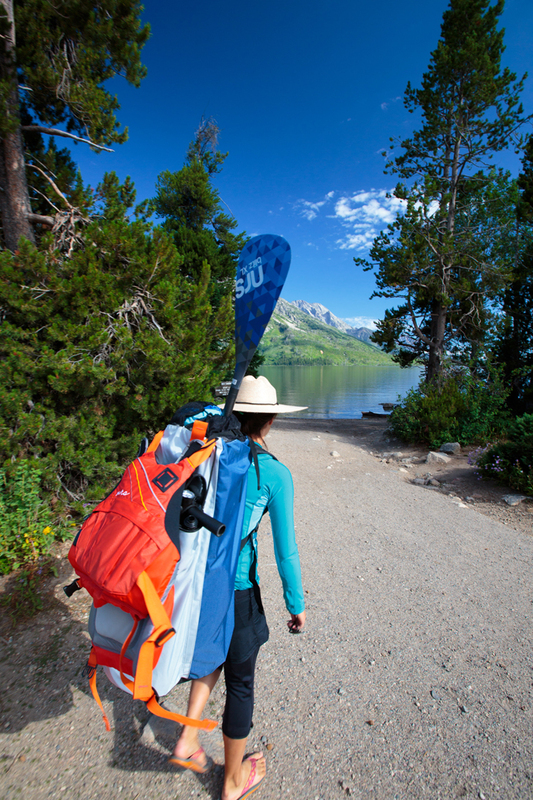 A woman carries inflatable board, paddle and PFD to Jenny Lake in the Grand Teton National Park. Stand up paddling is an activity nearly everyone will enjoy. Recent survey’s conducted showed the popularity of SUP growing at a tremendous rate. Stand up paddle boarding was listed as the #1 sport in terms of new participants in 2015. With all of the newcomers, some paddlers might think having a board and a paddle is all you really need to go out on the water. Some thought and consideration to SUP safety must be a priority. US Coast Guard classifies stand up paddle boards as vessels, which requires all participants to wear an approved PFD at all times. In addition, the National Center for Cold Water Safety defines cold water at 77 degrees Fahrenheit or below, so proper water immersion gear is also necessary for many areas. Two SUP paddlers enjoy and early spring float. The SUP leash is overlooked in paddle board safety. Things may change quickly, even on flat water. Cold water, strong currents and even wind can separate a paddler from their board very quickly. Therefore, a SUP leash may be referred to as a life-line while in an emergency situation on the water. Smart SUP paddler’s will minimize and often eliminate most of their risk by choosing to use a SUP leash. Furthermore specific SUP activities require different leashes. Let’s take a look at some of the major differences in SUP leashes. Best SUP leashes for surf will be at least 1 foot longer than the paddle board. Look for a medium thickness, six (6) millimeters or thicker straight leash. The straight variety will not tangle as easily as the coiled version and will allow the board to move away from your body without ricocheting back. SUP surfers tend to use a calf style leash, helping to keep their feet free to cross step along the board. Placid lake paddlers like to use a calf style coiled leash. Most coiled variety will keep the leash from dragging in the water and be free from tangle around the foot area. Coiled leashes do have their downside and have been known to ricochet back at the paddler in a fall. Good practice will have paddlers fall with their feet towards the SUP and use their hands to protect their face and head in case of a ricochet. Special attention must be given to SUP leash selection for rivers. An ideal leash for river SUP will be a coiled leash equipped with a quick release. Paddlers should attach it around the waist or PFD to keep it from dangling in the water and potentially catching or snagging on the bottom. The Float Shack offers both a coiled and coiled quick release leash for your SUP rental. Most of all, your safety is our main concern therefore, we will choose the correct leash for your chosen float area and be sure to demonstrate the correct use and emergency release each and every time you choose to float with us. SUP Paddle – Getting the correct one! A woman does some SUP (stand up paddle board) on Jenny Lake a the Grand Teton National Park. It is important to become successful, in any activity, to use the correct gear. 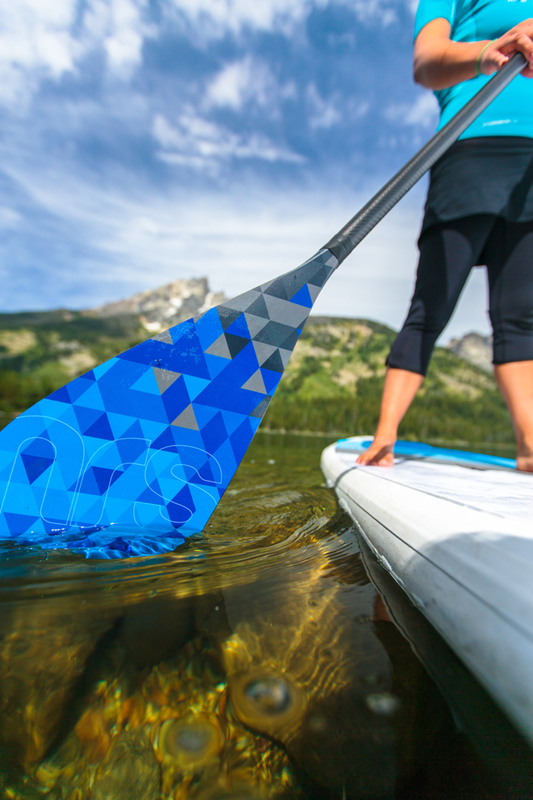 Just as choosing the correct stand up paddle board, the right SUP paddle will enable a paddler to enjoy a full day without compromising comfort, strength or weight. 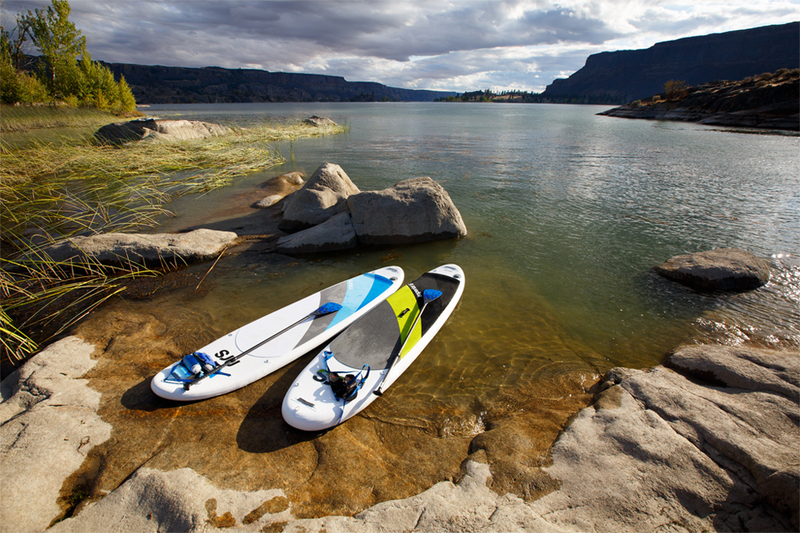 A few things to consider when choosing a SUP paddle: are size, construction and materials. The best paddle choice will be light enough to use all day and strong enough to handle any conditions that might arise while on the water. Your choice should also be comfortable, with the correct grip and length for a paddler to enjoy full days on the water. There are a variety of materials used in the construction of SUP paddles, each with their own benefits and limitations. The traditional material to craft the entire paddle or sometimes just the blade. Lightweight and easy to access, wood paddles provide warmth to the touch that cannot be matched with man-made synthetic materials. Wood paddles are beautiful and generally last for years. Lightweight and stiff, fiberglass is used for both shafts and blades. Provides a great balance between value and performance. A great economical material, although slightly heavier and cold to the touch. Another great economical material, although somewhat heavy. The lightest weight material used for paddle construction. Generally speaking, a lightweight paddle will cause lee arm fatigue. The most crucial part in choosing a SUP paddle is choosing the correct length. A SUP paddle that is too long will tire your arms as you hold them high out of the water. And a paddle that is too short will stress your back as you bend forward to reach the water. What length should I choose? A SUP paddle will vary in length depending the type of paddling you plan to do. Generally speaking, you will want to size your SUP paddle 10-12 inches taller than you if you plan to race, 8-10 inches taller if you’re cruising flat water, or 6-8 inches taller if you’re going to surf. Some waves. Adjustable paddles have the ability to extend and lock into different lengths. This feature allows more than one person to fit comfortably. Some manufactures will sell their paddles with extra-long shafts. This enables the paddle to be custom sized for the SUP paddler in the store. The staff will measure, cut the shaft to length and glue on the handle. SUP paddles are divided into two main types, one for the surf and one for cruising or touring. The SUP surf paddle generally has a larger surface area for extra leverage against the moving water. The larger surf paddle can be used for whitewater and SUP racing. 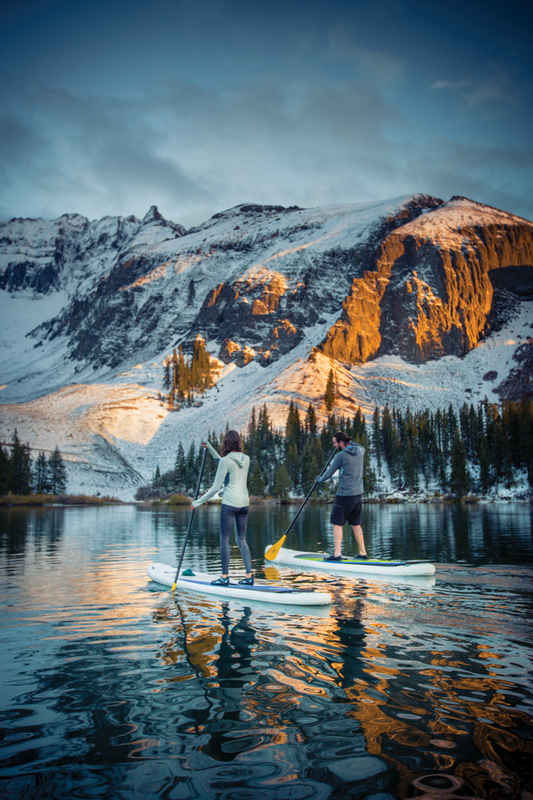 A touring SUP paddle will be slightly smaller surface area which helps to reduce the stress on the paddler’s arms while paddling long distances. Some manufactures, such as NRS are creating a mid-sized paddle. This size works well for touring and surfing waves. Why the bend in the blade? The bend in the SUP paddle, just above the blade allows for a more efficient stroke. The correct direction will have the blade facing forward and the elbow of the bend to be pointing to the rear. This may seem incorrect, but this allows the blade to slip effortlessly out of the water on the back of the stroke. If the paddle is faced incorrectly, the blade will try and lift water up on the exit. This places extra strain in the arms. the correct SUP paddle will be 8-10 inched above your head. A quick measure will be a comfortable reach to the paddle grip with the blade on the ground. This method is fast when using adjustable length paddles on demo fleets. By choosing a medium sized blade for your SUP paddle, you can ensure both wave surfing and touring paddling needs will be met. At the Float Shack we offer two sizes of fully adjustable paddles with our rental inflatable stand up paddle boards. Each size will accommodate numerous paddler height and reach. Our adjustable paddles will work great for both flat water and river running.